Places to see in Supur: Supur can well be termed as a temple town, as you can savor some impressive temple sites. 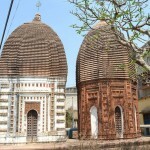 The twin temple of Lalbazar area in Supur is truly noteworthy. These two magnificent temples located inside a walled complex offers visual ecstasy by its exotic architectural style, featuring the ‘Rekh deul’ style of Architecture belonging to the art school of Orissa. One of the temples is octagonal in shape, while the other is patterned in circlular fashion. The octagonal shrine, especially features some extraordinary terracotta panels, on all the eight sides. Most of the panels depict some impressive carvings. For example, the most noteworthy carving is found above the main entrance, depicting Radha and Krishna. The panels are designed intricately attracting the visitors’ eyesight. One of the panels depict an interesting feature of a man riding a lion. There is also a huge panel of goddess Durga with her family at the rear side of the temple. You can also visit the ruins of the Suratheshwar Shiva temple, where you can find some ruined deities, pillars and couple of archaeological samples. Nearby attractions around Supur: You can y organize a tour to Shantiniketan, while making a trip to Supur from Bolpur. Shantiniketan is located at a very close distance from Bolpur. So you can easily hire a car to visit Shantiniketan. Things to do in Supur: Savoring the breathtaking beauty of the temples is the prime activity of the tourists visiting Supur. You can also explore the destination with the help of the local people. How to reach Supur: In order to reach Supur, board a train to Bolpur. From Bolpur station, you can hire a car, which will take around 30-minute to reach Supur. Best time to visit Supur: You can visit Supur any time of the year. Lodging and dining facilities Supur: It is better to stay at Bolpur, from where Supur can be reached in 30 minutes by car. You will find a number of accommodation options ranging from luxury to budget hotels in Bolpur. Decent dining facilities are also offered in most of the hotels.